Moscow had risen to a powerful position in the north due to its location and relative wealth and stability during the height of the Golden Horde. Ivan III overtook Novgorod, along with his four brothers’ landholdings, which began a process consolidating power under the Grand Prince of Moscow. Ivan III was the first prince of Rus’ to style himself as the Tsar in the grand tradition of the Orthodox Byzantine Empire. Vasili III followed in his father’s footsteps and continued a regime of consolidating land and practicing domestic intolerance that suppressed any attempts to disobey the seat of Moscow. Muscovite Sudebnik: The legal code crafted by Ivan III that further consolidated his power and outlined harsh punishments for disobedience. Novgorod: Moscow’s most prominent rival in the northern region. boyars: Members of the highest ruling class in feudal Rus’, second only to the princes. Ivan III was the first Muscovite prince to consolidate Moscow’s position of power and successfully incorporate the rival cities of Tver and Novgorod under the umbrella of Moscow’s rule. These shifts in power in the Northern provinces created the first semblance of a “Russian” state (though that name would not be utilized for another century). Ivan the Great was also the first Rus’ prince to style himself a Tsar, thereby setting up a strong start for his successor son, Vasili III. Between the two leaders, what would become known as the “Gathering of the Russian Lands” would occur and begin a new era of Russian history after the Mongol Empire’s Golden Horde. Ivan III Vasilyevich, also known as Ivan the Great, was born in Moscow in 1440 and became Grand Prince of Moscow in 1462. He ruled from this seat of power until his death in 1505. He came into power when Moscow had many economic and cultural advantages in the norther provinces. His predecessors had expanded Moscow’s holdings from a mere 600 miles to 15,000. The seat of the Russian Orthodox Church was also centered in Moscow starting in the 14th century. In addition, Moscow had long been a loyal ally to the ruling Mongol Empire and had an optimal position along major trade routes between Novgorod and the Volga River. Ivan III: He held the title of Grand Prince of Moscow between 1462 and 1505. However, one of Ivan the Great’s most substantial accomplishments was refusing the Tatar yoke (as the Mongol Empire’s stranglehold on Rus’ lands has been called) in 1476. Moscow refused to pay its normal Golden Horde taxes starting in that year, which spurred Khan Ahmed to wage war against the city in 1480. It took a number of months before the Khan retreated back to the steppe. During the following year, internal fractures within the Mongol Empire greatly weakened the hold of Mongol rulers on the northeastern Rus’ lands, which effectively freed Moscow from its old duties. The other major political change that Ivan III instigated was a major consolidation of power in the northern principalities, often called the “Gathering of the Russian Lands.” Moscow’s primary rival, Novgorod, became Ivan the Great’s first order of business. The two grand cities had been locked in dispute for over a century, but Ivan III waged a harsh war that forced Novgorod to cede its land to Moscow after many uprisings and attempted alliances between Novgorod and Lithuania. The official state document accepting Moscow’s rule was signed by Archbishop Feofil of Novgorod in 1478. Any revolts that arose out of Novgorod over the next decade were swiftly put down and any disobedient Novgorodian royal family members were removed to Moscow or other outposts to discourage further outbursts. In addition to capturing his greatest rival city, Ivan III also collected his four brothers’ local lands over the course of his rule, further expanding and consolidating the land under the power of the Grand Prince of Moscow. Ivan III also levied his political, economic, and military might over the course of his reign to gain control of Yaroslavl, Rostov, Tver, and Vyatka, forming one of the most unified political formations in the region since Vladimir the Great. This new political formation was in contrast to centuries of local princes ruling over their regions relatively autonomously. Palace of Facets pillar: This decadent pillar resides in the Palace of Facets built by Italian architects in stone in the mostly wooden Moscow Kremlin. This banquet hall was only one of many major architectural feats Ivan III built during his reign in Moscow. Styling himself the “Tsar and Autocrat” in Byzantine style, essentially stepping into the new leadership position in Orthodoxy after the fall of the Byzantine Empire. These changes also occurred after he married Sophia Paleologue of Constantinople, who had brought court and religious rituals from the Byzantine Empire. He stripped the boyars of theirlocalized and state power and essentially created a sovereign state that paid homage to Moscow. He oversaw the creation of a new legal code, called Muscovite Sudebnik in 1497, which further consolidated his place as the highest ruler of the northern Rus’ lands and instated harsh penalties for disobedience, sacrilege, or attempts to undermine the crown. The princes of formerly powerful principalities now under Moscow’s rule were placed in the role of service nobility, rather than sovereign rulers as they once were. Ivan III’s power was partly due to his alliance with Russian Orthodoxy, which created an atmosphere of anti-Catholicism and stifled the chance to build more powerful western alliances. Vasili III was the son of Sophia Paleologue and Ivan the Great and the Grand Prince of Moscow from 1505 to 1533. He followed in his father’s footsteps and continued to expand Moscow’s landholdings and political clout. He annexed, Pskov, Volokolamsk, Ryazan, and Novgorod-Seversky during his reign. His most spectacular grab for power was his capture of Smolensk, the great stronghold of Lithuania. He utilized a rebellious ally in the form of the Lithuanian prince Mikhail Glinski to gain this major victory. Vasili III: This piece was created by a contemporary artist and depicts Vasili III as a scholar and leader. Vasili III also followed in his father’s oppressive footsteps. He utilized alliances with the Orthodox Church to put down any rebellions or feudal disputes. He limited the power of the boyars and the once-powerful Rurikid dynasties in newly conquered provinces. He also increased the gentry’s landholdings, once more consolidating power around Moscow. In general, Vasili III’s reign was marked by an oppressive atmosphere; he carried out harsh penalties for speaking out against the power structure or showing the slightest disobedience to the crown. Ivan IV, or Ivan the Terrible, reigned from 1547 to 1584 and became the first tsar of Russia. His reign was punctuated with severe oppression and cultural and political expansion, leaving behind a complex legacy. Ivan IV is often known as Ivan the Terrible, even though the more correct translation is akin to Ivan the Fearsome or Ivan the Awesome. Ivan IV was the first Rus’ prince to title himself “Tsar of All the Russias” beginning the long tradition of rule under the tsars. Lands in the Crimea, Siberia, and modern-day Tatarstan were all subsumed into Russian lands under Ivan IV. The persecution of the boyars during Ivan IV’s reign began under the harsh regulations of the oprichnina. Moscow Print Yard: The first publishing house in Russia, which was opened in 1553.
boyar: A member of the feudal ruling elite who was second only to the princes in Russian territories. oprichnina: A state policy enacted by Ivan IV that made him absolute monarch of much of the north and hailed in an era of boyar persecution. Ivan IV successfully grabbed large chunks of land from the nobility and created his own personal guard, the oprichniki, during this era. Ivan IV Vasileyevich is widely known as Ivan the Terrible or Ivan the Fearsome. He was the Grand Prince of Moscow from 1533 to 1547 and reigned as the “Tsar of all the Russias” from 1547 until he died in 1584. His complex years in power precipitated military conquests, including Kazan and Astrakhan, that changed the shape and demographic character of Russia forever. He also reshaped the political formation of the Russian state, oversaw a cultural Renaissance in Russia, and shifted power to the head of state, the tsar, a title that had never before been given to a prince in the Rus’ lands. Ivan IV was born in 1530 to Vasili III and Elena Glinskaya. He was three when he was named the Grand Prince of Moscow after his father’s death. Some say his years as the child vice-regent of Moscow under manipulative boyar powers shaped his views for life. In 1547, at the age of sixteen, he was crowned “Tsar of All the Russias” and was the first person to be coronated with that title. This title claimed the heritage of Kievan Rus’ while firmly establishing a new unified Russian state. He also married Anastasia Romanovna, which tied him to the powerful Romanov family. 18th-century portrait of Ivan IV: Images of Ivan IV often display a prominent brow and a frowning mouth. Revised the law code, the Sudebnik of 1550, which initiated a standing army, known as the streltsy. This army would help him in future military conquests. Developed the Zemsky Sobor, a Russian parliament, along with the council of the nobles, known as the Chosen Council. Regulated the Church more effectively with the Council of the Hundred Chapters, which regulated Church traditions and the hierarchy. Established the Moscow Print Yard in 1553 and brought the first printing press to Russia. Oversaw the construction of St. Basil’s Cathedral in Moscow. St. Basil’s Cathedral: This iconic structure was one cultural accomplishment created under Ivan IV’s rule. The 1560s were difficult with Russia facing drought and famine, along with a number of Tatar invasions, and a sea-trading blockade from the Swedes and Poles. Ivan IV’s wife, Anastasia, was also likely poisoned and died in 1560, leaving Ivan shaken and, some sources say, mentally unstable. Ivan IV threatened to abdicate and fled from Moscow in 1564. However, a group of boyars went to beg Ivan to return in order to keep the peace. Ivan agreed to return with the understanding he would be granted absolute power and then instituted what is known as the oprichnina. 1911 painting by Apollinary Vasnetsov: This painting represents people fleeing from the Oprichniki, the secret service and military oppressors of Ivan IV’s reign. This agreement changed the way the Russian state worked and began an era of oppression, executions, and state surveillance. It split the Russian lands into two distinct spheres, with the northern region around the former Novgorod Republic placed under the absolute power of Ivan IV. The boyar council oversaw the rest of the Russian lands. This new proclamation also started a wave of persecution and against the boyars. Ivan IV executed, exiled, or forcibly removed hundreds of boyars from power, solidifying his legacy as a paranoid and unstable ruler. Ivan IV established a powerful trade agreement with England and even asked for asylum, should he need it in his fights with the boyars, from Elizabeth I. However, Ivan IV’s greatest legacy remains his conquests, which reshaped Russia and pushed back Tatar powers who had been dominating and invading the region for centuries. His first conquest was the Kazan Khanate, which had been raiding the northeast region of Russia for decades. This territory sits in modern-day Tatarstan. A faction of Russian supporters were already rising up in the region but Ivan IV led his army of 150,000 to battle in June of 1552. After months of siege and blocking Kazan’s water supply, the city fell in October. The conquest of the entire Kazan Khanate reshaped relations between the nomadic people and the Russian state. It also created a more diverse population under the fold of the Russian state and the Church. Ivan IV also embarked on the Livonian War, which lasted 24 years. The war pitted Russia against the Swedish Empire, the Polish-Lithuanian Commonwealth, and Poland. The Polish leader, Stefan Batory, was an ally of the Ottoman Empire in the south, which was also in a tug-of-war with Russia over territory. These two powerful entities on each edge of Russian lands, and the prolonged wars, left the economy in Moscow strained and Russian resources scarce in the 1570s. Ivan IV also oversaw two decisive territorial victories during his reign. The first was the defeat of the Crimean horde, which meant the southern lands were once again under Russian leadership. The second expansion of Russian territory was headed by Cossack leader Yermak Timofeyevich. He led expeditions into Siberian territories that had never been under Russian rule. Between 1577 and 1580 many new Siberian regions had reached agreements with Russian leaders, allowing Ivan IV to style himself “Tsar of Siberia” in his last years. Ivan IV’s throne: This decadent throne mirrors Ivan the Terrible’s love of power and opulence. Ivan IV left behind a compelling and contradictory legacy. Even his nickname “terrible” is a source for confusion. In Russian the word grozny means “awesome,” “powerful” or “thundering,” rather than “terrible” or “mad.” However, Ivan IV often behaved in ruthless and paranoid ways that favors the less flattering interpretation. He persecuted the long-ruling boyars and often accused people of attempting to murder him (which makes some sense when you look at his family’s history). His often reckless foreign policies, such as the drawn out Livonian War, left the economy unstable and fertile lands a wreck. Legend also suggests he murdered his son Ivan Ivanovich, whom he had groomed for the throne, in 1581, leaving the throne to his childless son Feodor Ivanovich. However, his dedication to culture and innovation reshaped Russia and solidified its place in the East. The Time of Troubles occurred between 1598 and 1613 and was caused by severe famine, prolonged dynastic disputes, and outside invasions from Poland and Sweden. The worst of it ended with the coronation of Michael I in 1613. The Time of Troubles started with the death of the childless Tsar Feodor Ivanovich, which spurred an ongoing dynastic dispute. Famine between 1601 and 1603 caused massive starvation and further strained Russia. Two false heirs to the throne, known as False Dmitris, were backed by the Polish-Lithuanian Commonwealth that wanted to grab power in Moscow. Rurikid Prince Dmitry Pozharsky and Novgorod merchant Kuzma Minin led the final resistance against Polish invasion that ended the dynastic dispute and reclaimed Moscow in 1613. Feodor Ivanovich: The last tsar of the Rurik Dynasty, whose death spurred on a major dynastic dispute. Dmitry Pozharsky: The Rurikid prince that successfully ousted Polish forces from Moscow. Zemsky Sobor: A form of Russian parliament that met to vote on major state decisions, and was comprised of nobility, Orthodox clergy, and merchant representatives. The Time of Troubles was an era ofRussian history dominated by a dynastic crisis and exacerbated by ongoing wars with Poland and Sweden, as well as a devastating famine. It began with the death of the childless last Russian Tsar of the Rurik Dynasty, Feodor Ivanovich, in 1598 and continued until the establishment of the Romanov Dynasty in 1613. It took another six years to end two of the wars that had started during the Time of Troubles, including the Dymitriads against the Polish-Lithuanian Commonwealth. At the death of Feodor Ivanovich, the last Rurikid Tsar, in 1598, his brother-in-law and trusted advisor, Boris Godunov, was elected his successor by the Zemsky Sobor (Great National Assembly). Godunov was a leading boyar and had accomplished a great deal under the reign of the mentally-challenged and childless Feodor. However, his position as a boyar caused unrest among the Romanov clan who saw it as an affront to follow a lowly boyar. Due to the political unrest, strained resources, and factions against his rule, he was not able to accomplish much during his short reign, which only lasted until 1605. Tsar Boris Godunov: His short-lived reign was beset by famine and resistance from the boyars. While Godunov was attempting to keep the country stitched together, a devastating famine swept across Russian from 1601 to 1603. Most likely caused by a volcanic eruption in Peru in 1600, the temperatures stayed well below normal during the summer months and often went below freezing at night. Crops failed and about two million Russians, a third of the population, perished during this famine. This famine also caused people to flock to Moscow for food supplies, straining the capital both socially and financially. The troubles did not cease after the famine subsided. In fact, 1603 brought about new political and dynastic struggles. Feodor Ivanovich’s younger brother was reportedly stabbed to death before the Tsar’s death, but somepeople still believed he had fled and was alive. The first of the nicknamed False Dmitris appeared in the Polish-Lithuanian Commonwealth in 1603 claiming he was the lost young brother of Ivan the Terrible. Polish forces saw this pretender’s appearance as an opportunity to regain land and influence in Russia and the some 4,000 troops comprised of Russian exiles, Lithuanians, and Cossacks crossed the border and began what is known as the Dymitriad wars. Vasili IV of Russia: He was the last member of the Rurikid Dynasty to rule in Moscow between 1606 and 1610. False Dmitri was supported by enough Polish and Russian rebels hoping for a rich reward that he was married to Marina Mniszech and ascended to the throne in Moscow at Boris Godunov’s death in 1605. Within a year Vasily Shuisky (a Rurikid prince) staged an uprising against False Dmitri, murdered him, and seized control of power in Moscow for himself. He ruled between 1606 and 1610 and was known as Vasili IV. However, the boyars and mercenaries were still displeased with this new ruler. At the same time as Shuisky’s ascent, a new False Dmitri appeared on the scene with the backing of the Polish-Lithuanian magnates. Shuisky retained power long enough to make a treaty with Sweden, which spurred a worried Poland into officially beginning the Polish-Muscovite War that lasted from 1605 to 1618. The struggle over who would gain control of Moscow became entangled and complex once Poland became an acting participant. Shuisky was still on the throne, both the second False Dmitri and the son of the Polish king, Władysław, were attempting to take control. None of the three pretenders succeeded, however, when the Polish king himself, Sigismund III, decided he would take the seat in Moscow. The boyars quarreled amongst themselves over who should rule Moscow while the throne remained empty. Russian Orthodoxy was imperiled and many Orthodox religious leaders were imprisoned. Catholic Polish forces occupied the Kremlin in Moscow and Smolensk. Swedish forces had taken over Novgorod in retaliation to Polish forces attempting to ally with Russia. Tatar raids continued in the south leaving many people dead and stretched for resources. Two strong leaders arose out of the chaos of the first decade of the 17th century to combat the Polish invasion and settle the dynastic dispute. The powerful Novgordian merchant Kuzma Minin along with the Rurikid Prince Dmitry Pozharsky rallied enough forces to push back the Polish forces in Russia. The new Russian rebellion first pushed Polish forces back to the Kremlin, and between November 3rd and 6th (New Style) Prince Pozharsky had forced the garrison to surrender in Moscow. November 4 is known as National Unity Day, however it fell out of favor during Communism, only to be reinstated in 2005. The dynastic wars finally came to an end when the Grand National Assembly elected Michael Romanov, the son of the metropolitan Philaret, to the throne in 1613. The new Romanov Tsar, Michael I, quickly had the second False Dmitri’s son and wife killed, to stifle further uprisings. Michael I: The first Romanov Tsar to be crowned in 1613. Despite the end to internal unrest, the wars with Sweden and Poland would last until 1618 and 1619 respectively, when peace treaties were finally enacted. These treaties forced Russia to cede some lands, but the dynastic resolution and the ousting of foreign powers unified most people in Russia behind the new Romanov Tsar and started a new era. The Romanov Dynasty was officially founded at the coronation of Michael I in 1613. It was the second royal dynasty in Russia after the Rurikid princes of the Middle Ages. The Romanov name stayed in power until the abdication of Tsar Nicholas II in 1917. The Romanovs were exiled during the Time of Troubles but brought back when Romanovs Patriarch Philaret and his son Michael were politically advantageous. Michael I was the first Romanov Tsar and began a long line of powerful rulers. Alexis I successfully navigated Russia through multiple uprisings and wars and created long-lasting political bureaus. After a long dynastic dispute, Peter the Great rose to power and changed Russia with the new capital of St. Petersburg and western influences. Old Believers: Followers of the Orthodox faith the way it was practiced before Alexis I convened the Great Moscow Synod and changed the traditions. Duma chancellory: The first provincial administrative bureau created under Alexis I. In Russian it is called Razryadny Prikaz. Rurikid: A descendent of the Rurik Dynasty, which dominated seats of power throughout Russian lands for over six centuries before the Romanov Dynasty began. The House of Romanov was the second major royal dynasty in Russia, and arose after the Rurikid Dynasty. It was founded in 1613 with the coronation of Michael I and ended in 1917 with the abdication of Tsar Nicholas II. However, the direct male blood line of the Romanov Dynasty ended when Elizabeth of Russia died in 1762, and Peter III, followed by Catherine the Great, were placed in power, both German-born royalty. The earliest common ancestor for the Romanov clan goes back to Andrei Kobyla. Sources say he was a boyar under the leadership of the Rurikid prince Semyon I of Moscow in 1347. This figure remains somewhat mysterious with some sources claiming he was the high-born son of a Rus’ prince. Others point to the name Kobyla, which means horse, suggesting he was descended from the Master of Horsein the royal household. Whatever the real origins of this patriarch-like figure, his descendants split into about a dozen different branches over the next couple of centuries. One such descendent, Roman Yurievich Zakharyin-Yuriev, gave the Romanov Dynasty its name. Grandchildren of this patriarch changed their name to Romanov and it remained there until they rose to power. The Romanov Dynasty proper was founded after the Time of Troubles, an era between 1598 and 1613, which included a dynastic struggle, wars with Sweden and Poland, and severe famine. Tsar Boris Godunov’s rule, which lasted until 1605, saw the Romanov families exiled to the Urals and other remote areas. 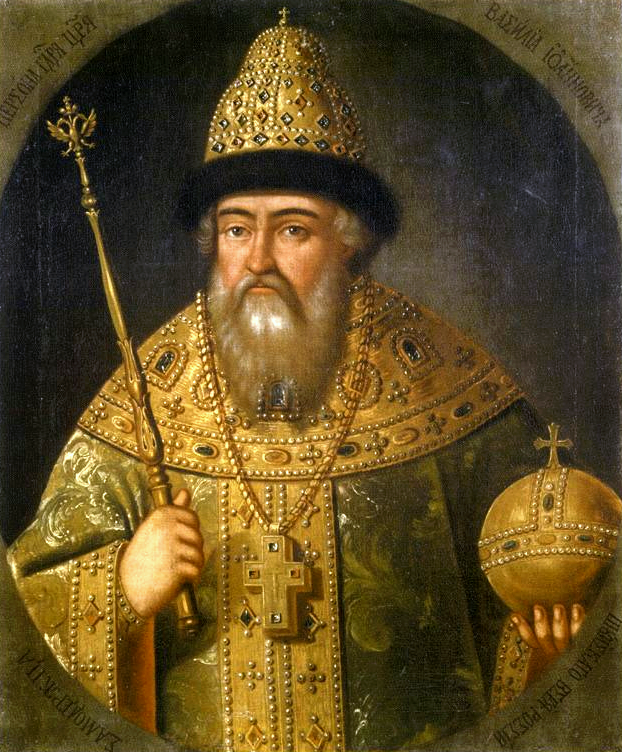 Michael I’s father was forced to take monastic vows and adopt the name Philaret. Two impostors attempting to gain the throne in Moscow attempted to leverage Romanov power after Godunov died in 1605. And by 1613, the Romanov family had again become a popular name in the running for power. Patriarch Philaret’s son, Michael I, was voted into power by the zemsky sober in July 1613, ending a long dynastic dispute. He unified the boyars and satisfied the Moscow royalty as the son of Feodor Nikitich Romanov (now Patriarch Philaret) and the nephew of the Rurikid Tsar Feodor I. He was only sixteen at his coronation, and both he and his mother were afraid of his future in such a difficult political position. Representation of a young Michael I: He rose to power in Moscow when he was just sixteen and went on to become an influential leader in Russian history. Michael I reinstated order in Moscow over his first years in power and also developed two major government offices, the Posolsky Prikaz (Foreign Office) and the Razryadny Prikaz (Duma chancellory, or provincial administration office). These two offices remained essential to Russian order for a many decades. Michael I ruled until his death in 1645 and his son, Alexis, took over the throne at the age of sixteen, just like his father. His reign would last over 30 years and ended at his death in 1676. His reign was marked by riots in cities such Pskov and Novgorod, as well as continued wars with Sweden and Poland. Alexis I of Russian in the 1670s: His policies toward the Church and peasant uprisings created new legal codes and traditions that lasted well into the 19th century. However, Alexis I established a new legal code called Subornoye Ulozheniye, which created a serf class, made hereditary class unchangeable, and required official state documentation to travel between towns. These codes stayed in effect well into the 19th century. Under Alexis I’s rule, the Orthodox Church also convened the Great Moscow Synod, which created new customs and traditions. This historic moment created a schism between what are termed Old Believers (those attached to the previous hierarchy and traditions of the Church) and the new Church traditions. Alexis I’s legacy paints him as a peaceful and reflective ruler, with a propensity for progressive ideas. At the death of Alexis I in 1676, a dynastic dispute erupted between the children of his first wife, namely Fyodor III, Sofia Alexeyevna, Ivan V, and the son of his second wife, Peter Alexeyevich (later Peter the Great). The crown was quickly passed down through the children of his first wife. Fyodor III died from illness after ruling for only six years. Between 1682 and 1689 power was contested between Sofia Alexeyevna, Ivan V, and Peter. Sofia served as regent from 1682 to 1689. She actively opposed Peter’s claim to the throne in favor of her own brother, Ivan. However, Ivan V and Peter shared the throne until Ivan’s death in 1696. This portrait was a gift to the King of England and displays a western style that was rarely scene in royal portraits before this time. He is not wearing a beard or the traditional caps and robes that marked Russian nobility before his rule. Peter went on to rule over Russia, and even style himself Emperor of all Russia in 1721, and ruled until his death in 1725. He built a new capital in St. Petersburg, where he built a navy and attempted to wrest control of the Baltic Sea. He is also remembered for bringing western culture and Enlightenment ideas to Russia, as well as limiting the control of the Church.